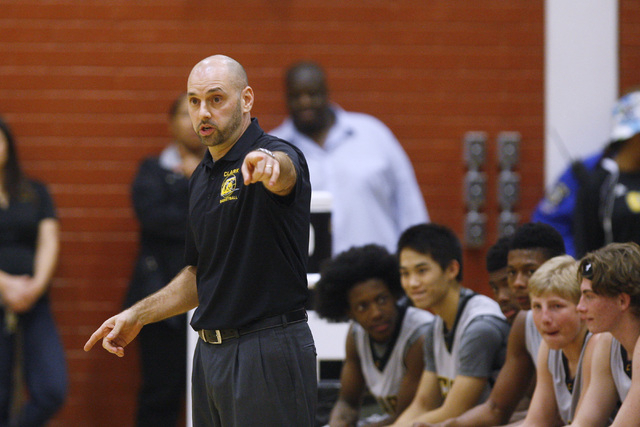 Chad Beeten, who led Clark’s boys to the past three Division I-A state basketball titles, is the new coach at Crossroads High in Santa Monica, California. Chad Beeten loved coaching basketball at Clark High. But he couldn’t pass up an opportunity to leave behind the real estate world and work on basketball full time. Beeten, who led the Chargers to the past three Division I-A state basketball titles, is the new coach at Crossroads High in Santa Monica, California. Beeten said he will be on campus full time at Crossroads. In Las Vegas, he had a real estate business to make ends meet. Crossroads was 12-17 this past season, but it is the alma mater of former NBA All-Star Baron Davis and was previously a strong program. Beeten was 132-44 in six seasons at Clark. The Chargers were 123-30 over the last five seasons, including 22-9 this past season. Beeten leaves the program in good shape. The team’s top two scorers were seniors, but the next eight were freshmen or sophomores. Clark athletic director Don Willis said the school is just beginning its search for a new coach. “We appreciate what coach Beeten did for us while he was here,” Willis said. “But he’s got a great opportunity out there. We wish him the best.